“What is the purpose of MedShadow?” That’s a question I often have to answer. And my response usually goes something like this: To inform people about the side effects, risks and benefits of all kinds of medicines so they can make better health care decisions. I then usually add something that pharmaceutical and supplement industries do a great job at touting the benefits of their products, while rarely mentioning potential downsides. And that’s where MedShadow’s content is indispensable. Since MedShadow is completely independent from industry influence and our content is evidence-based, you can trust what we publish. In 2017, the FDA received more than 1.8 million reports of adverse events related to medications. These are just those that were voluntarily reported and the true number is likely far higher. For comparison, in 2009, the FDA received just 490,000 reports. Between 2009 and 2017, the FDA received around 5 million reports of serious adverse events. This figure doesn’t include deaths. About 1 million deaths potentially linked to medications have been reported over that period. MedShadow was founded in 2013 by Suzanne Robotti for a very personal reason. When she was 14, she found out she would be unable to bare children because her mother was given a drug, (DES) diethylstilbestrol, when she was pregnant with her. And while MedShadow started out focusing on prescription medications, we’ve expanded since then to cover over-the-counter drugs, nutritional supplements and even benefits of alternative medicines. The goal of MedShadow has always been to raise the public’s awareness of the side effects of medicines. We have primarily done this through a mix of features, news articles, blogs and patient stories on our website, as well as a robust social media presence. But we want to expand our reach even further. On November 1, we will hold our first event, in New York City, bringing together medical experts, political leaders, concerned patients and others who support our mission of educating people about the risks and benefits of medicine. Caring about medication side effects and being as informed as possible about them will make you more empowered in your own treatment with your health care provider. 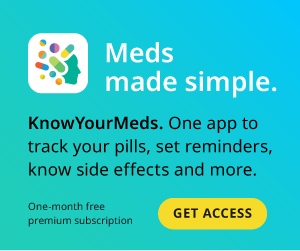 When you have a question about a drug you have been prescribed or a supplement you are thinking of taking, consider MedShadow your trusted resource.